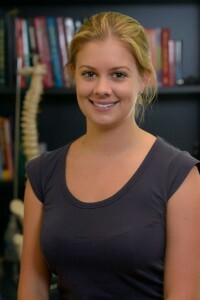 Dr. Laura Montgomery is a board certified Chiropractor, who graduated from Macquarie University in Sydney. She was awarded the ‘Chiropractic Education of Australia Prize for Academic Proficiency’ and the ‘Sports Chiropractic Australia Graduate Prize’ upon completion of her Masters of Chiropractic degree in 2012. Laura has committed to further education in functional neurology, functional movement and rehabilitation, cranial and paediatric chiropractic techniques. Laura is skilled in helping you with your postural concerns, low back pain, headaches, neck pain, shoulder injuries and general wellbeing. Laura believes that long-term health and wellness is largely determined by the decisions you make and lifestyle choices you create.